HMSTrust has a long history of supporting organisations with grants specifically aimed at building their capacity so they can operate more efficiently and effectively in delivering their services to Victorian communities. When we introduced our grants matrix strategy in 2014, capacity building was included as one of our five key objectives, and over this time, our support of capacity building grants has steadily increased. In FY17, 22 of the 73 approved grants were specifically towards capacity building initiatives. Strong programs, outcomes and impact are delivered by strong organisations with a sustainable business model and diverse revenue streams. They are well resourced with professional staff who are committed to delivering excellence, they understand the benefits of strategic collaboration, are adaptable, resilient, innovative, and have their ear to the ground. Too many good organisations are under-resourced and are unable to achieve their potential. 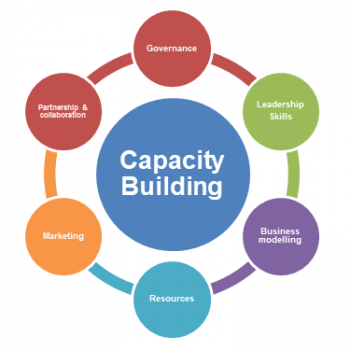 We believe that building organisational capacity is a wise investment for achieving long-term outcomes. 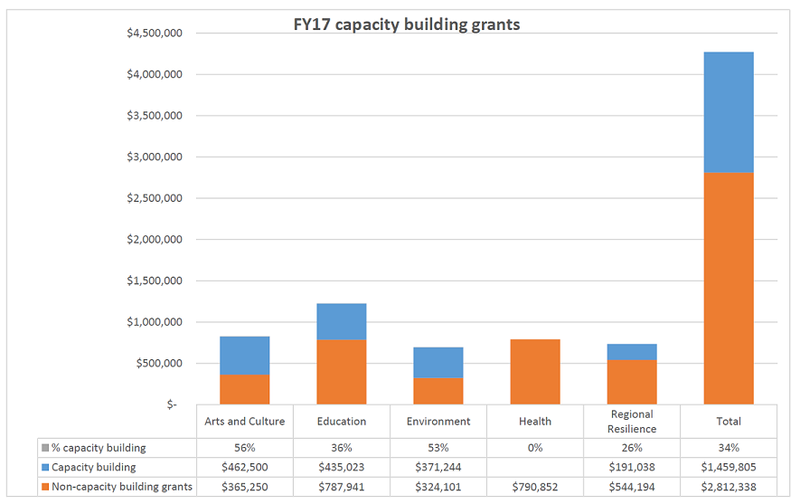 Every one of the 22 capacity building grants funded in FY17 will at the very least provide an additional resource to operations and hopefully, deliver long-term benefits that align with our vision. Some are riskier than others, and these tend to be the ones that will take a significant length of time to develop, but are considered by the Trustees as a risk worth taking. An issue for many organisations is poor business development capacity that directly impacts on their ability to generate revenue. In FY17 we supported Ballarat International Foto Biennale, BalletLab, Central Victorian Biolinks Alliance, Melbourne Youth Orchestras, and SPELD to develop and implement long-term revenue generating strategies. Grants that we will be watching in the years ahead include: Green Collect, an innovative social enterprise providing re-use and up-cycling solutions for hard-to-recycle office items. We collaborated with Philanthropy Australia and NAB to co-fund Green Collect to work with Social Traders to review and develop a business strategy to enable them to scale their operations. Multicultural Arts Victoria’s brokerage enterprise is an innovative business unit that addresses their core purpose of providing work opportunities to local artists from diverse cultural backgrounds and aims to build a long-term revenue stream. Federation University’s powerful online network, SWIFFT, (State Wide Integrated Flora and Fauna Teams) is designed to share biodiversity knowledge, observations, projects, current events, ideas and access information from experts in their field. Information on the site is drawn from up to 50 datasets including Department of Environment, Land, Water and Planning, Atlas of Living Australia, BirdLife Australia and the Victorian Biodiversity Atlas. With 30% of our FY17 grants specifically targeting capacity building projects, our philosophy of patient funding is standing us in good stead.